ARSA's declaration drew no formal response from the military or the government of Buddhist-majority Myanmar. However, through the twitter, spokesman for Myanmar's leader, Aung San Suu Kyi, said that " We have no policy to negotiate with terrorists." Myanmar has rejected a ceasefire declared by Muslim Rohingya militants to provide the humanitarian aid to thousands of displaced people in the violence-racked Rakhine. In an order to provide aid assistance, the Arakan Rohingya Salvation Army (ARSA) insurgent group has announced a temporary cessation of offensive military operations to allow humanitarian aid to reach the battered region. The violence in Myanmar started on August 25, when insurgents attacked Myanmar police and paramilitary posts in what they said was an effort to protect minority Rohingya. In response, the military started what it called "clearance operations" to wipe out the insurgents. Around 294,000 Rohingyas Muslims have arrived in just only 15 days in Bangladesh, according to the United Nations. Thousands of Rohingya remaining in the northwestern state of Rakhine have been left without shelter or food, and many are still trying to reach Bangladesh. According to Myanmar, security forces are carrying out clearance operations to defend against ARSA, which the government has declared a terrorist organization. On Sunday, in Bangladesh's Cox's Bazar, mostly women and child Rohingyas were in the queue for handouts of food and clothes. Around 300 people arrived on boats and fishing trawlers on Shah Prior Dwip Island. Many collapsed on the bench from motion sickness and dehydration. 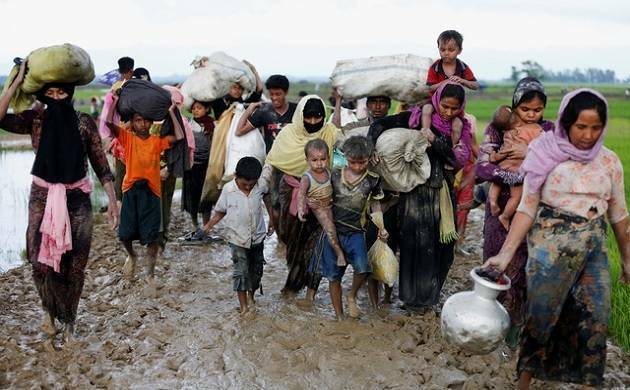 As per the Bangladeshi border guard, three Rohingya were killed by landmines as they tried to cross from Myanmar. This is not the first landmine incidents, before that, there were two incidents, according to the Amnesty International. In order to prevent trespassing, the landmines had been laid along the border in the 1990s and since then military had tried to remove them, according to the Myanmar security. Dipayan Bhattacharyya, the World Food Programme’s spokesman in Bangladesh said the latest estimate of new arrivals was 294,000 and there were discussions underway to revise up the prediction made last week that it would reach 300,000. The United Nations has urged for aid funding of $77 million to cope with the emergency in southern Bangladesh. The wave of hungry and traumatized refugees is “showing no signs of stopping”, the U.N. Resident Coordinator in Bangladesh Robert Watkins said in a statement late on Saturday. Aung San Suu Kyi has faced criticisms for not handling the situation properly. Critics complain that Suu Kyi, who won a Nobel peace prize for championing democracy has failed to speak out for a persecuted minority.